Close up shot of woman at electro stimulation therapy. Electro bio stimulation of thighs and buttocks. Rejuvenate therapy. Hardware cosmetology. 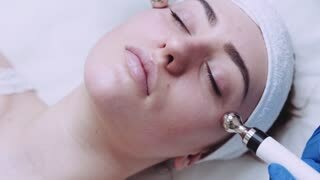 Young beautiful woman lying on the clinical table, the cosmetologist makes her a facial electro-stimulation massage. Lifting procedure, hardware cosmetology. Luxury lifestyle, model activities.